Sailing aboard the Pandora, from Crete to Athens, Andy Alytis encounters Mina, a loopy blonde with "eyes like stars", that enthralls him in spite of himself. He decides to tag after her group of friends, seven back packers on their way to climb Mt. Olympus on the mainland and determined to be there "by full moon". Mid-course, the ferry is forced to take refuge on Yria, an obscure island where Santorini's fulminating volcano lights up the southern horizon. Determined to reach Olympus, the seven travelers venture ashore by day, scouting Yria for alternate ways to the mainland. By night they carouse fitfully in Pandora's close quarters. Scouting on his own, Andy introduces them to his onshore discovery: Dinosaki's cafenion! 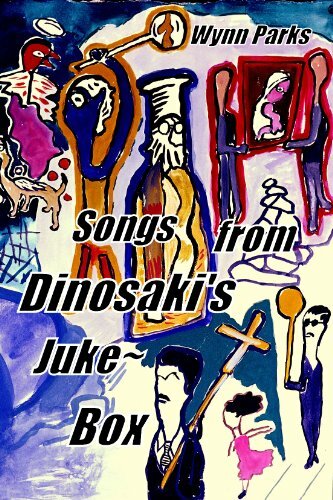 What makes Dinosaki's special is the ancient jukebox in the corner, and Sophia, a gouty, expatriate, former astrology columnist, who consents, for a consideration, to divine the travelers' fortunes. Every evening, in the cafenion, one of the companions plays a different song on the jukebox. Sophia translates the lyrics from Greek, cautioning the group that she is merely "channeling for the jukebox", but solemnly warranting that each person's song will contain a truth recognized by that person only. Thus, is spun, out of Sophia's interpretations, seven quirky, dark "songs", redolent with sardonic humor; haunted by ghosts of Dionysian Greece. Between those nightly convocations, the back packers try to guess the meanings of their songs. Andy, himself, struggles with the sweet agony of his obsession with Mina, and nightly sees the volcano on Santorini inflame more and more of the horizon.